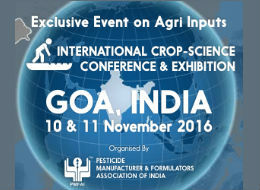 The event is a great opportunity for the manufacturers and formulators of Agrochemicals, Producers & Distributors of Biopesticides, Seeds, Micro-nutrients, Public Health Products, Spray Equipments, Packaging & Labelling etc. Agriculture is the mainstay of Kenyan economy as also of its neighbouring countries Tanzania, Ethiopia, Malavi etc. and there is a great demand for Agri inputs. These countries are growing cash crops which requires plant protection chemicals, seeds, biopesticides, fertilizers to improve the yields.